Improving on the bicycle is a little like improving the mouse trap: plenty of people have tried, but the original always comes out ahead in the end. Three designers – Kenny Gibbs, Antonio Belmonto, and Seena Zandipour – have figured out a way to at least make an add-on to the bike that increases its usefulness. 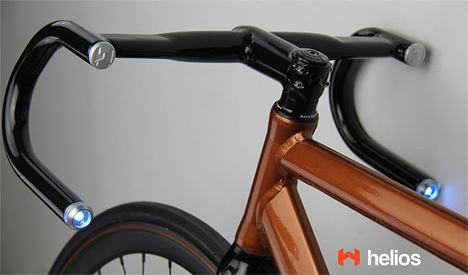 Helios Handlebars can be put onto any bike to turn it into a kind of smart bike. 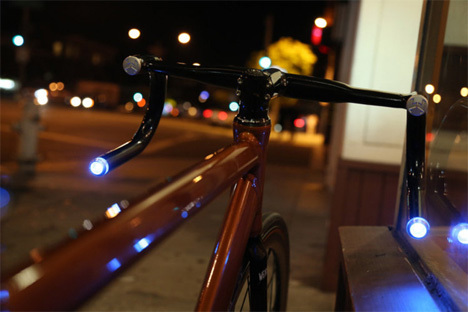 The Helios Handlebars feature built-in LED headlights which can act as turn signals. The bars are equipped with GPS tracking and Bluetooth 4.0 connectivity, which is perhaps the best part of the whole project. Pair the Helios handlebars with your phone and the lights will come on when you come into range. When you get where you’re going and walk away from your bike, the lights turn off. 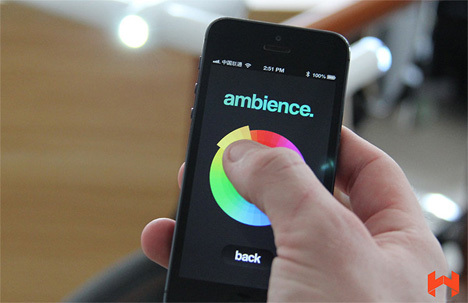 The associated app lets you change the colors of the handlebar lights. The tiny GPS unit is inside the handlebars and can tell you how fast you’re going. But better yet, if you equip the GPS with a SIM card, it can receive a text message that you send to it, then report the bike’s location. If your bike is ever stolen, it can tell you exactly where to find it. Eventually, the designers want to create an even more ambitious project: a totally computerized smart bike. See more in Bikes & Cycles or under Transportation. August, 2013.